Sam Wildow | Miami Valley Today Middy Smith (right) and Betty Cohee (left), of the St. James Episcopal Church knitting group, crocheting scarves for local school kids. Sam Wildow | Miami Valley Today Sandy Couchot (right) and Linda Cooper (left), of the St. James Episcopal Church knitting group, crocheting scarves for local school kids and clipping coupons. Sam Wildow | Miami Valley Today Linda Cooper, front right, Sandy Abernathy, back right, Carol Campbell, standing, Margaret French, center left, and Vie Das, left, of the St. James Episcopal Church knitting group work on winter wear that they will donate to local students in need. 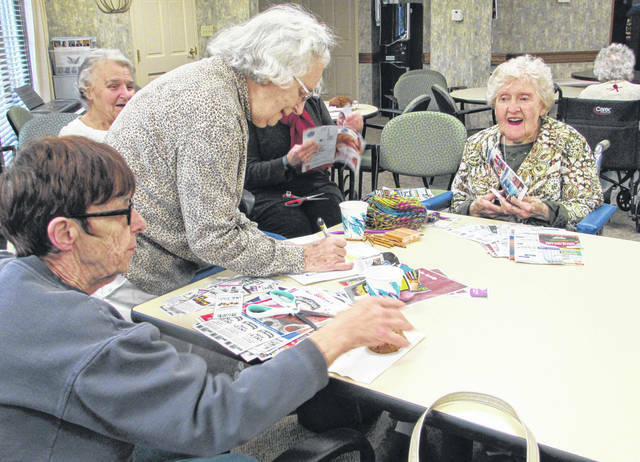 Sam Wildow | Miami Valley Today Middy Smith, front right, Betty Cohee, right, Sandy Couchot, center left, and Linda Cooper, left, of the St. James Episcopal Church knitting group, crochet scarves for local school kids and clip coupons. PIQUA — A local knitting group is creating scarves and other items for Piqua students in need this winter. The St. James Episcopal Church knitting group, along with some residents of Garbry Ridge, are knitting and crocheting scarves and other items to give to kindergartners in Piqua. “The St. James knitting circle has been going for quite some time,” group member Sandy Abernathy said. They meet every Tuesday at 10 a.m. at Garbry Ridge, located at 1567 Garbry Road, and are composed of members from different churches and different parts of the community. Abernathy said that they moved the knitting group to Garbry Ridge so that one of the founding members of the group, Vie Das, could still take part. They will be making approximately 300 pieces for local students in case they need help keeping warm this winter. This is their fourth year donating to local students. The knitting group includes people who knit, crochet, and also help clip coupons for the church, and is open to anyone who wants to take part. The coupons go toward those who may need them at the church or in the community, or the group sends them to military bases to use. Abernathy added that they also occassionally donate to Riverside. St. James Episcopal Church is located at 200 High St. in Piqua and can be contacted at (937) 773-1241 for more information. 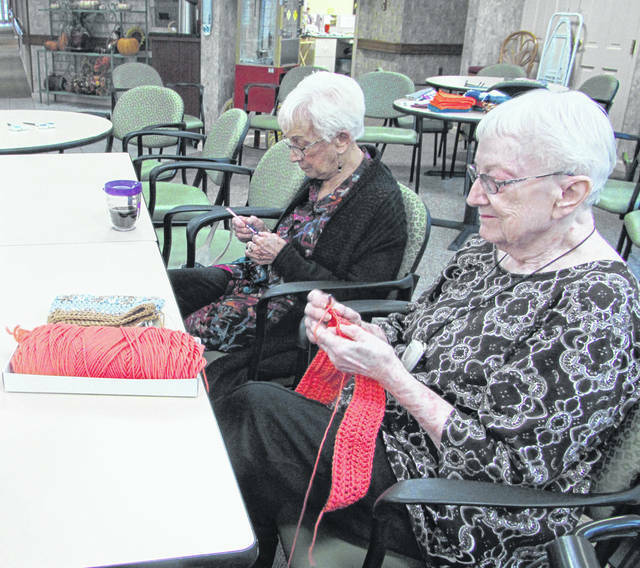 https://www.dailycall.com/wp-content/uploads/sites/30/2018/11/web1_Knitting-group-1-CMYK.jpgSam Wildow | Miami Valley Today Middy Smith (right) and Betty Cohee (left), of the St. James Episcopal Church knitting group, crocheting scarves for local school kids. 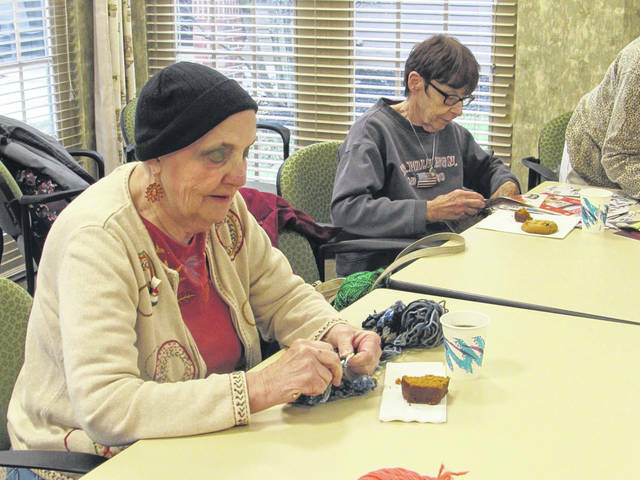 https://www.dailycall.com/wp-content/uploads/sites/30/2018/11/web1_Knitting-group-2-CMYK.jpgSam Wildow | Miami Valley Today Sandy Couchot (right) and Linda Cooper (left), of the St. James Episcopal Church knitting group, crocheting scarves for local school kids and clipping coupons. https://www.dailycall.com/wp-content/uploads/sites/30/2018/11/web1_Knitting-group-3-CMYK.jpgSam Wildow | Miami Valley Today Linda Cooper, front right, Sandy Abernathy, back right, Carol Campbell, standing, Margaret French, center left, and Vie Das, left, of the St. James Episcopal Church knitting group work on winter wear that they will donate to local students in need. 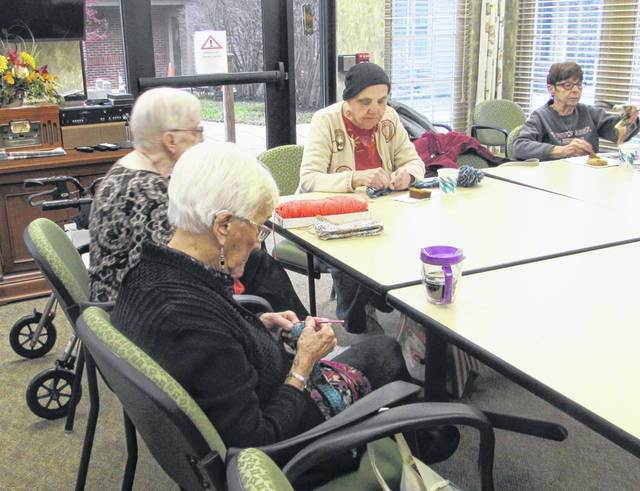 https://www.dailycall.com/wp-content/uploads/sites/30/2018/11/web1_Knitting-group-4-CMYK.jpgSam Wildow | Miami Valley Today Middy Smith, front right, Betty Cohee, right, Sandy Couchot, center left, and Linda Cooper, left, of the St. James Episcopal Church knitting group, crochet scarves for local school kids and clip coupons.